Last Wednesday we finally got to meet Liberty Rose... not that she was late or anything, it's just that I had been in labor, literally, not just "felt like" I was in labor, for the entire month of October. As in, we had stuff ready for delivery at home, in the car, or for the quick trip to the hospital from the end of September on, and with good reason. There were at least 6 separate evenings/afternoons where we thought we were going to the hospital and several nights where I would be ready to wake Tom up to get ready to leave only to have labor stop. And there was progress, but obviously no baby. Every week our doctor would say, I don't think we'll see you next week... haha. We scheduled an induction for October 23rd, thinking we were ready, only to have illness hit our family with a vengeance... mine going into sinus and ear infections and who knows what else. It was not the flu, but everyone except Tom got very ill with fever, cough, and congestion. It took me a week and a half to start feeling decent again (we cancelled the induction). Baby Liberty stayed put and we were glad she did. We even made it through Halloween without a baby. The next Monday we again scheduled an induction for Friday, November 6th. Wednesday November 4th I was having a rough afternoon (this was nothing new, happened several times a week all through October lol) and told Tom when he got home that I wondered whether or not he should go to scouts with the kids or not. I went to bed for a while, uncomfortable and kind of grumpy. He chose not to go. At 8 pm I started feeling contractions and wondered if this was finally the night... by 8:30 we wondered if they were going to stop like every other time so far LOL. Tom got the younger kids in bed. By 9 I was telling Tom we should get ready to go. Tom got the older kids in bed, gave Michael the phone and had him sleep on the couch, and we left for the hospital around 9:15. My doctor got there and they decided they wanted an IV put in before we broke my water. So... three tries later and lots of bruises, no dice. They gave up at that point, at least... doctor broke my water, time to push, everything happened all at once and with one push Liberty Rose Valencic was born at 10:28... they were talking about 8 10 and I wasn't quiet clear yet and said oh, ok, that's how much Joseph weighed... duh, those were the Apgar scores LOL... but then they brought her back after weighing and she weighed.... tada... 8 lbs 10 oz rofl. 20 1/2 inches long, and beautiful. So, less than an hour at the hospital and baby was born, pretty typical for us lol. I was happy to avoid the induction this time around, but glad we were there at the hospital long enough for the doctor to get there. 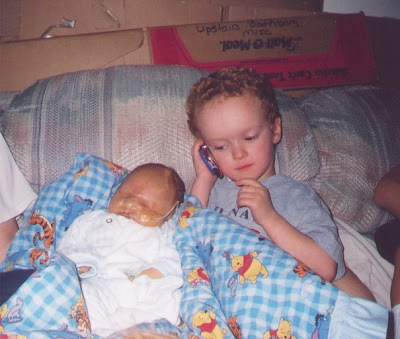 We called Michael at home to let him know baby was born so he could let anyone know who was still awake... Tom stayed long enough for them to get me and baby settled and he went home to share the news with anyone we hadn't called yet via email etc. :) I have to say we are VERY glad she is finally here. There were those days I thought I would be pregnant forever. Timothy had a birthday :) He turned three on November 10th. He is our other early November birthday, meaning I was hoping to have him before Halloween, haha. He is growing so fast! Here he is opening a "Screaming Banshee" truck from Cars, the Pixar movie. He still loves cars and anything with wheels. He got the hang of opening presents pretty quick. He loves being the center of attention, loved getting presents and being sung to, and having fun with everyone reminding him he was three. He learned how to show three on his fingers and said that he was three all day. He is just starting to talk much and he had a lot to say on his birthday. Here we are all singing "Happy Birthday" to Timothy and you can see his happy face. He loves his cake. He talked about it all day. Birthday cake pretty much covers it. He knew what to do with those candles! He blew them right out. He didn't need even one little bit of help or a reminder of what to do. Happy birthday to our Timothy! Big boy! We love having Timothy in our family. It's rough some days with him not talking and able to tell us what is going on in his mind, but he tries hard to let us know what is going on with him. His favorite foods are pancakes, sandwiches and chocolate milk. And of course, birthday cake. He also loves bananas. He loves his new baby sister and also plays an "echo" game with Christopher, usually when we'd like them to both be quiet like at bedtime or at church. He likes Winnie the Pooh still but really likes Benjamin's new Voltron dvd collection and then goes and makes a Voltron out of Duplo blocks. Timothy is a joy to have around, usually ready to smile and give every one hugs. Anyway, Benjamin turned 11 on October 4th. He is now a Boy Scout. He earned his Arrow of Light and will be receiving it later this month, but he has already been working on Boy Scout rank activities. He is a great helper, especially with Timothy and Christopher as well as in the kitchen. He likes to cook and help with lunch. He does very well changing diapers too. He will be a great babysitter. I'm a little behind... things have been crazy around here with labor for a month... but Liberty is finally here and I will write a blog post about that. This post is about Benjamin, though. I can't believe he's already 11. 11 years ago he was born during General Conference, or at least right before the Sunday morning session. It was very cool being able to watch Conference in my hospital room. He went with Dad and Michael to Priesthood session this year. Benjamin is our active boy, but also a voracious reader. He is the one who went to the ER on Dad's birthday with what we thought was a broken nose (which looks a lot better now, by the way) and also is reading his way through the library and our bookshelves. He is in 5th grade this year and starting some new concepts, which he is mostly doing great at. His favorite place to be is outside on his bike or reading on the couch. He loves helping, being with his family, legos, building, reading, and being outside. He is talented and learns more every day how to do what is right. We are blessed to have him in our family. Ever since I had a child who could read the calendar, the change of seasons has been fun. We've learned the months, the seasons, the days of the week, the holidays, etc. It's a wonderful part of homeschooling. This year I have a complaint to file. Every year, with every child, I've stressed that just because the calendar says it's spring, summer, fall or winter, that doesn't mean you expect flowers and no more cold weather that day in March, or nice warm temperatures and getting to wear shorts on June 21st, or the leaves changing color and wearing sweatshirts in September, or snow on December 21st (my birthday, which is always cool...). This year it's Nathanael and Samuel learning dates and paying more attention to seasonal changes and I've stressed how these changes are gradual as the earth changes its angle toward the sun and the weather gradually gets cooler. I am losing all credibility here, come on. Here in Texas, especially in the panhandle, if you don't like the weather, wait a minute. I am loving it. However, I'm laughing at myself. It's good for you, try it. Not a whole lot new. School has started and we have lots of stuff going. Everyone is busy at work, though we still need to get Michael's advanced algebra book. He is fine for now, has plenty to work on between Italian, research report, and literature, plus various merit badges he's working on. He is now a Star and still working hard towards Eagle. Busy 7th grader with activities every week for Young Men. I can't believe he'll be a teenager in 2 months. He is very responsible, great at babysitting (which is a huge help with doctor appointments and other short errands) and a big help in everything, as well as a good example to those around him in any situation. He is still short for his age but our family hits growth spurts late. Benjamin is now in 5th grade, working hard on English, Italian, finishing up some old math work before he starts PreAlgebra stuff. I need to get everyone going on Spelling, science, and maybe health. History is still going strong as we read and watch everything we can find about the Revolutionary War. He will be 11 in just a few weeks (General Conference weekend) and will move on from Webelos to 11 year old Scouts. He is almost done with his Arrow of Light, but I tease him that he's cutting it close! He just needs a little extra motivation sometimes. He is a little frustrated right now that Emilie is a bit taller than him. He will grow. Emilie is in a homeschool ballet class. This is very different from her previous classes, which were more performance based and simple steps. This class is much more technical and she is learning a lot. She has learned what she needs to work on and what she does well naturally. It is nice as a mom to see her learn and apply herself to something she loves. It is also nice to have teachers that point out what she does well to her (and me) as well as help her work on her shortcomings. I think it is good for her to be in a class with other homeschooled girls her age. She is taking French through the same program the boys are doing for Italian. Her math is coming along, and she is not sure what she thinks of our English work this year, but she can do it. She still loves Activity Days at church and is trying lots of new things. Nathanael is in 1st grade now, reading very well, and getting better at focusing and working harder. He likes to read and draw. We really have not started anything new with him but he is coming along with what we do formally. I debated starting a math program we did with Emilie but I think he would not do well with busywork and we will keep up with the concepts in everyday life learning. It is odd that we will not have a Cub Scout in our home til he turns 8 in about a year and a half. Then we will have Cub Scouts til Christopher turns 11! Nathanael learning out loud has probably really helped Samuel learn to read. Samuel is our newest reader; at 4 years old he is not the youngest, Michael was about the same age and reading. It is fun to read with him and see the light bulb go on. He loves science and new library books, and playing with Nathanael. He and Nathanael are also getting a huge kick out of teaching Timothy new words. Hoping just the good ones... :) He likes doing schoolwork, too, but we keep it simple and he is working on writing skills. Christopher is getting tall. He is very long and skinny for his age. He will be 18 months at the end of September. He doesn't say much but we moved him to Nathanael and Samuel's room at the beginning of the month and he's doing great, for both bedtime and naps. He's been a bit sick the last little while though. We aren't sure how he's going to do with the new baby; while he loves babies, he's been very clingy around mom lately. He loves cars and playing with Timothy. Thank goodness he still naps once a day, otherwise he's very grouchy. Liberty is growing and growing and very active. We have no idea when she's coming, but most likely late October. We will have an ultrasound this week to see how she's doing and a possible size estimate. She's feeling very big. Tom and I are doing the same. Life is good, callings, job, and kids are keeping us very busy, though I'm having to slow down quite a bit with the whole 8 months pregnant thing. After having 8, I guess contractions are old hat and come easier and earlier. Anyway, thats our life at the moment with Cub Scouts and Relief Society and Elders Quorum callings. Tom does have to travel once more before the baby comes, but hopefully no more til after she's here! That's it for updates, I'll have more pictures next time. Benjamin and Michael made bread... Benjamin's was kneaded with the kitchenaid and a different recipe than Michael's, below, but both turned out GREAT. oh and our solar oven again. This has been a great month. Finished up some of our summer homeschool stuff, got a lot of Scout stuff done, getting ready for school, Timothy using new words, no major illnesses or accidents or ER trips, lol... started the month with a temple trip... Michael got his Star in Boy Scouts and Benjamin got his Webelos and is well on his way to earning his Arrow of Light. Emilie is busy with Activity Days and working hard on that. She starts ballet again on Friday and is very excited. Tonight is a pack meeting but we've also gone to two Court of Honors, one for an Eagle Scout we know. Our project right now is organizing everything in our dining room to be ready for our homeschool year. Another project is getting ready for baby girl. We have decided on a name for our baby girl number 2, or, baby 9 as we also affectionately refer to her. Rose comes into play on both sides of the family, if you look back far enough. Anyway, wanted to share. No pictures this time, though we might have another ultrasound to share before she's born in 10 weeks or so. This is from our trip to the Lubbock, Texas temple as part of a Primary activity with our ward. It was a great activity! It was hot and everyone was thirsty and tired after the long car drive and then walking around the beautiful temple grounds in the sun. However, still very worth it, the kids will remember this for a long time. til baby girl will be here. We can count down now in just 2 digits, eek! At least we still have 3 months left. We do NOT have any names yet. Time to move Christopher into the younger boys' room and get our room set up for another newborn. Not too much longer before I start washing baby clothes and receiving blankets. We have the car seat, we know how we're moving around car seats in the car also... Samuel goes back a row, Timothy goes back to Samuel's seat and baby girl will be on the same row as Christopher. Weird thinking that baby girl may be born during cold, hot or in between weather. Here in Texas it could really be all of the above the last week of October, first week of November. Usually cooler but not cold yet. Just thinking out loud. The one who is the most excited is Emilie. We did find a matching dress for the baby, it matches (or is close in color and style) to one of Em's dresses. We have Emilie's blessing dress too and planning on blessing the baby around Thanksgiving. Are we ready to be a family of 10? (11 counting Joseph!) 10 people in a 12 passenger van... crazy. Oh, and we will have to add a sticker to the back window, haha. No pictures to share this time. Just talking about the next few months! 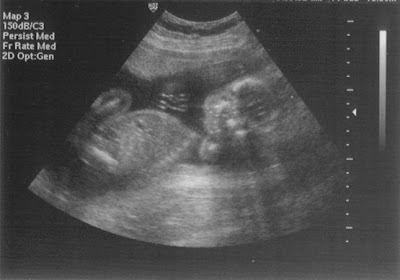 We have lots of ultrasound pictures, here you can see his face and upper torso. You can see him sucking his thumb here. First time I held him. I believe I mentioned he always had his arm up by his face... well... he tried to be born that way. Michael and Joseph. This was in the family visitors room at the NICU. Family visiting time at the NICU, our whole family. All swaddled... maybe my only child to like this. Gifts from admirers and his pictures of his brothers and sister. Joseph's last evening with us. I think you can see how tired he is and some of the bruising from the seizures/attacks, around his face. It was hard to keep his little heart beating with so many different defects! We had an angel in our home. He was beautiful, and for most of the time (that I choose to remember lol) we had a peaceful, happy time with him, even with 4 children 4 and under. I have a lot of memories that are NOT on his website, and the pictures on his website were made smaller so people with extremely low speed connections could see all of them. I would like to post some of the originals here, and will soon update his page (ok, someday, you can see how "up to date" our website is... I think Christopher's picture is when he was only 3 months old...). Joseph was born in July 2001. He was a surprise baby. Emilie was only 7 months old when we found out we were expecting again, and honestly? I was probably less than overjoyed. I had 3 children 3 and under and they wore me out! Tom worked over 50 hours a week and that's probably a conservative estimate. Some days he worked past midnight, sometimes he left early and got home after dark. I liked his days off in the middle of the week, but Sundays without him were rough. My patient visiting teacher gave me rides to church with 3 kids in car seats almost every week. I am not sure what I got out of church juggling those three and pregnant, but the kids knew where we were going to be each and every Sunday. One Sunday comes to mind where someone gave Michael a blue sucker on our way in to the chapel... sigh... you know where that ended up... lol... Tom was great with his work and when he was home he was (and of course is) an awesome dad, hands on, and when he wasn't, he was supporting our family. So we found out we were expecting a baby. Everything was routine (other than one scary evening where we thought I was miscarrying, early on in the pregnancy) until about 18 weeks or so. 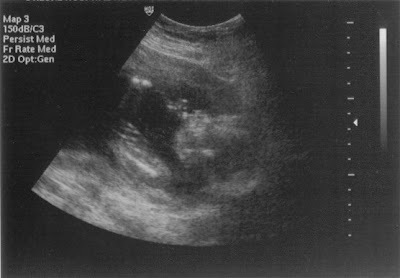 The routine ultrasound turned up some abnormalities and they asked if we'd like to do the amniocentisis. We refused, knowing the chances of a miscarriage from this test were far greater than ANY chance we would ever abort this baby and the information gained that might be helpful could be found out in other ways, just not worth that risk. So instead, they just scheduled some ultrasounds to keep an eye on our baby boy. Blood tests were showing abnormalities, but that is just a marker to suggest further testing, as well as what they were finding in the ultrasound, etc. The worst day came when another ultrasound to check on things suddenly took a turn for the worse and Joseph's amniotic fluid was so low that they wanted to take him that day... along with the tests, they pumped me full of IV fluids and signed me up to see some perinatologists in downtown Cincinnati. It was a bad day for that doctor's office, there was bad news for many patients that day and there were women crying in the hallways. I will always remember thinking that things always could be worse, Joseph still had a chance at life and we had options open to us. So we started going to a perinatologists office and I had twice weekly ultrasounds and NSTs. We got really good at setting these up ourselves when they were particularly busy. They decided what it looked like Joseph had was problems with his kidneys, possibly Polycystic Kidney Disorder, a highly hereditary disease usually affecting 1 in 4 children if both parents are carriers. Tom and I were at a loss to know what to do other than having faith, praying, and researching for all we were worth. The doctors were at a loss to find a set of parents who did not want to abort their child who had "something wrong" with him. We were talking to our kids about how we might not get to have Joseph with us for very long and if we did, he would need a lot of special care. Then it was a twice weekly ordeal to find babysitters for our other children, drive to downtown Cincinnati and spend a few hours in a doctor's office. During this time Tom changed stores, we moved, Benjamin got his tonsils and adenoids out (which was a tremendously good thing for him), and I was supposedly on some kind of bedrest. (haha, I tried!). We had wonderful friends from both of our wards (old and new, in Kentucky AND Ohio) who helped, as well as Tom's family who lived 6 hours away and helped with the move and then later with having someone staying with us and the kids to help. Medically, Joseph was doing great where he was. All his vitals were wonderful. The amniotic fluid got lower and lower and they told me each time there was a possibility of taking him C-Section very soon. There were family fasts and prayers with friends all over the country, from our favorite parenting site to strangers acquainted with our family. So many lives were touched by Joseph's life, and his death. They told me, well, if we aren't going to take him at this level, and everything else is still the same other than his fluid is lower, we'll just keep on with the wait and see. He kicked, he sucked his thumb. I knew my baby through ultrasound pictures. We couldn't see his face very well because his arm was always in front of his mouth. But we could see those little toes, fingers, eyes, we knew his kidneys very well. We told him he looked as pregnant as I did with his swollen kidneys. We shared these moments with our older children, even as young as they were. Joseph liked M&M's and always did better on his biophysical profiles when I ate some before our dr appts. Tom came to most of these appointments... I can only think of one time I went by myself. His fluids started to increase again. The doctors started talking about waiting longer and longer instead of having deadlines at 28, 30, 32, and then 35 weeks. His fluid levels even increased until they told me we could even delivery normally. Finally, we even decreased our doctor appointments to the normal once a week end of pregnancy frequency. Then one day, I had been telling our main OB/perinatologist that I had been having contractions more and more frequently but her putting off checking me for dilation, she checked me (the 17th of July that year, I think) and made some shocked noises. And decided baby Joseph needed to be induced that week, on July 19th. I was at a 5 and fully effaced, meaning if I was like most women I was already in labor, but not being like most women, I could deliver any moment... including on the drive to the doctor's which took at least 45 minutes and which could possibly be fatal for Joseph. We knew he would need special care at birth and we were just praying for him to take that first breath and cry. Babies with some of the problems we had found on ultrasound sometimes didn't make it that far. So, Joseph, who we already felt we knew through ultrasound and normal pregnancy stuff, may already be leaving us without even coming home. We prepared as best we could. Tom gave me a blessing the night before. Tom's sister was staying with the kids. We made the drive and got ready for anything. After nothing happening for a while, they decided to break my water and baby Joseph came shortly thereafter. Those were the longest seconds/minutes of my life waiting to hear a cry, anything, but it came. They examined him and were getting him to breathe more but he was grunting and having trouble regulating his temperature so they held him up to me for just a second before rushing him off to the NICU. Tom told me he had 6 fingers on each hand and 6 toes on each foot and that his kidneys didn't seem to be as bad as we thought because he just peed on everyone. Go Joseph! He also had a severe cleft lip and palate. The next few hours was a rush of activity as doctors kept coming in and talking to me about their findings. They said they were testing him for different things because this PKD didn't seem to fit. Tom went home to be with our other children but would be back and was able to call while I was still in recovery. Then Joseph was breathing better on his own and one of the doctors was able to get a good look at him and saw in his face a genetic disorder that, like Down's, had its own look and they were able to narrow down testing. They then came and talked to me and told me a bit more and I was able to pass this on to Tom. Tom was there when they confirmed that Joseph had Trisomy 13, a normally fatal disorder than affects every system of the body and this is what caused a lot of the abnormalities in his heart, kidneys, and other areas. Up until this time they had been planning on moving him to Children's to plan for immediate heart surgery to fix some of the things they were finding wrong. This was when he was less than 24 hours old and we were frantically trying to figure out how to get me discharged so I could be with him. Instead, things calmed down as we discussed, with the doctors, a gentler approach. No, we didn't "let" him die. We let him live. We would have had no time with him and he probably would not have lived through the various surgeries to fix the problems in his heart that made his little body work so hard. What we did decide was that we wanted to bring him home as soon as possible and everyone who had any dealings with Joseph at that hospital did everything they could to make this happen. Anyway, at 24 hours old I walked to the NICU and held my baby. He calmed down immediately. He was living up to his bright coppery hair and gave the nurses a run for their money. With me holding him or touching him they were able to get wonderful ultrasound images of his major organs and how they were working because he calmed down so well. They taught me to read his oxygen sensors when I held him so we could get him back on his oxygen if needed. Even though he went home without any sensors at all. 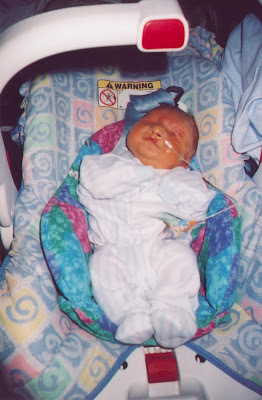 I learned to feed him though his tube, and then to change his feeding tube. We also learned to feed him with a Haberman feeder, which was harder for him but a good experience to not depend on just his tube. He was so sweet and it was heaven to hold him. We went home after 4 days at the hospital, only one night I spent at home away from Joseph, and they set us up with hospice care. These hospice nurses helped us with anything we needed even though we had been taught anything we might need to know for Joseph's care. The first night we were home was awful. Joseph didn't react to the car ride very well, our older children didn't react to changes very well, and the evening was just frantically stressful trying to get everyone together for prayer and just some peace. 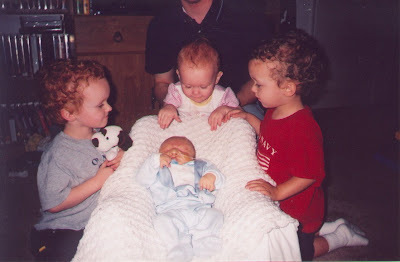 Joseph had some breathing issues that night and we were afraid we were going to lose him that quickly, with none of our children spending any time with him in any positive way. After that, things calmed down. Joseph rested and adjusted to life at home. He patiently endured his siblings loving attention. Emilie (15 months) was exuberant about her baby and it was hard to keep her from patting him... Benjamin (2 1/2)was starting to talk better after getting his tonsils and adenoids out and loving "baby Jopef". Michael (4 1/2)was older than his years and trying to adjust his thinking to Joseph being here but being sick... and fitting his heart around missing him already. Tom, thankfully, was still on time off from work and we were able to spend this entire time together with his family there too. I think it was easier for us to BE a family at home rather than having some of us at the hospital and some at home. Those eight days were wonderful. We settled into a routine of being with Joseph. He was just there with us through normal days and nights. Tom and I slept with the light on and with Joseph between us, because he never cried. Even when he was hungry or needed his diaper changed. He did get a little agitated and we were able to meet his needs and help him be with us. After a few days I noticed he would have a sort of seizure, and that he was in pain. The hospice nurses immediately found out what we could give him and we adjust the dosage so he was still awake but not in pain all the time. He was basically having heart attacks. At the same time he started having apnea episodes, where he would stop breathing for minutes at a time. We would use the stethoscope given to us for placing his feeding tube to make sure his heart was still beating. And it was. If you look at our pictures it was just normal life with a newborn, but we were making the most of every minute. Not that we were cramming every minute with stuff to "remember", but that we were keeping our lives so simple that we could focus on our family for that week. We took pictures, yes, and on one beautiful day Joseph had NO bad periods but all the kids held him and we took pictures of our whole family together and then the kids just gathered around him and loving him. Friends in our new ward brought meals and offered to take our other children. We did try to keep our family together most of the time because we didn't know how long we had. We were also learning about funeral options and such. On July 31st, we had a peaceful evening but Joseph was still having breathing issues and seizing up. Close to midnight, I wasn't in the room but Tom called to me and told me Joseph wasn't breathing. I came as soon as I could and we held him together. We knew when his heart stopped beating, though we did check. After a while we called who we needed to call. As an amusing aside, the hospice nurse we called first was worried when she came to our complex, as a police car was there, (not at our apartment) and even though we had a DNR order (do not resuscitate) she thought there might be problems. The funeral home workers came later. I changed Joseph and put him in clean clothes and held him for the last time. The hearse had a big back, and a box to put smaller bodies in. This was 3 am. I walked out with Tom and the workers looked at little Joseph and decided to hold him on the short drive to the funeral home instead of putting him in the back by himself. I know this was irrational on my part, as his Spirit was no longer in that little body, but what a compassionate act. And what a difficult job. The next two days were days of cleansing and preparation. Family came. Anton was already here but the rest of Tom's family came and my brother Jason came. The kids played at friends' houses and knew Joseph was gone and were sad, but they were very young. We decided they had not been prepared enough to view Joseph's body in a coffin or to see that coffin buried, and they did not attend the funeral. It was very strange attending a funeral for my baby. I cried at odd times. The music shared there still touches me in a different way than other hymns/music. I appreciate everyone who attended even though we were fairly new in the area and a great deal of family were not able to make it. Our new bishop was out of town for all of this, and our old bishop came and spoke instead. It was a wonderful thing and I know that hope was felt by all there, as we heard of things that were important to us and to Joseph. Joseph is still touching lives through his website and our family. I hear at least several times a year of someone who has shared our trials and who was touched by our story and able to make difficult decisions. I just want to update his website and share his story all over again. We were able to have a lot of memories preserved through the website and pictures and scrapbooks (Joseph's scrapbook is DONE, don't ask me about my other kids' books...) and I am still moved to tears thinking of the outpouring of love from friends and family through Joseph's entire pregnancy, life, and in all the 8 years since that time. Joseph was born on my brother Jeff's birthday, and sometimes I forget Jeff's birthday in remembering Joseph's... but not for long. I remember my friend who had a little boy pass away that same year, Daniel, where Joseph gets his middle name. I know they know each other now. And for another friend who had a baby the day before, who is still here, and the things we experienced together as mothers at the same time but in different ways. Joseph is part of my testimony of my Heavenly Father's love for me and how He knows what each of us can endure and grow through. I know His plan, and I am prepared to share what I know of Him with anyone and everyone who wants to know more. Joseph is my little missionary, he is my angel, and he is my example. On a lighter note, Tom says we needed someone to go ahead of us so he can plead our case. "Really, they aren't that bad!". Someday I'll be able to return to his gravesite. We moved away from Cincinnati less than a year later, as Tom changed jobs and we ended up in eastern Ohio. This time of year we celebrate Joseph's life as a family, and remember him. Sure, we have had 4 children since but they know who Joseph is, through pictures and memories and maybe something more. I had 5 boys in 7 years and they all are really close to me. Now I am expecting again and as our time gets closer, I remember Joseph all over again and how our family is stronger in so many ways because of his life with us. I am probably going to do a separate picture post with better images than on his website. Friday, July 10th, 2009 was the 5th annual Chick Fil A'Cow Appreciation Day' and everyone who came into their restaurant wearing a cow costume got a free value meal... was this worth free food? Sure. Even Dad got in on the fun. Everyone else helped make their costumes. Samuel made big circles and then painted them. Nathanael cut white spots out of paper. It was a lot of fun, it was good food, and something different for our family to have fun with!